A Slice of Smith Life: 7 Quick Takes: Something Other Than God Review, Jumping Baby, etc. 7 Quick Takes: Something Other Than God Review, Jumping Baby, etc. We already know that the host of the weekly 7 Quick Takes Friday is a really great person and blogger, but she's also a fabulous author too! 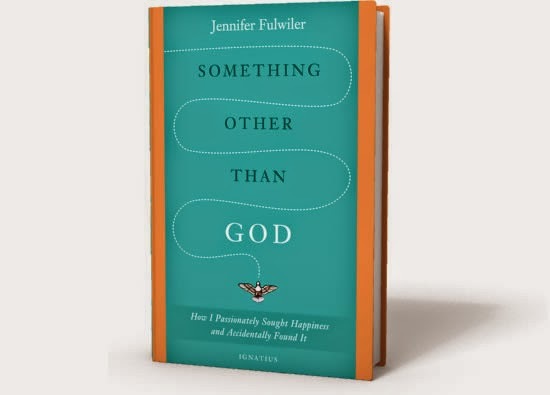 I read Something Other Than God: How I Passionately Sought Happiness and Accidentally Found It by Jennifer Fulwiler and posted a review HERE and HERE. If you are looking for a great summertime read or anytime read, this one is for you! You can purchase a copy of Something Other Than God: How I Passionately Sought Happiness and Accidentally Found It from Amazon HERE. I just saw this graphic on my Facebook news feed. Can you see the beautiful image in the tree's branches? There is a talented Catholic author named Dominic de Souza, who wrote The Ring of Fantasy, and I did a review of this adventurous tale HERE. Dominic has a beautiful family and he and his wife, Maria, have a GoFundMe page to help raise money for Maria's medical treatments. They have almost reached their goal in just a few days and they are hoping to get to the finish line soon! Be sure to read their story HERE and prayers and donations are always appreciated! It's getting waaaaaaay past my bedtime so I better sign off now. :) Maybe if I get some rest and can think more clearly I'll add Quick Take 6 and 7 to this post here. Until then for more Quick Takes visit Conversion Diary.